Norfolk & Western 1218 is a steam locomotive that at one time was the strongest-pulling operational steam locomotive in the world. It is a four-cylinder simple articulated locomotive with a 2-6-6-4 (Whyte system) wheel arrangement. The Norfolk & Western Railway built it in 1943 at its Roanoke Shops in Roanoke, Virginia, and was part of the Norfolk & Western's class A fleet of fast freight locomotives. 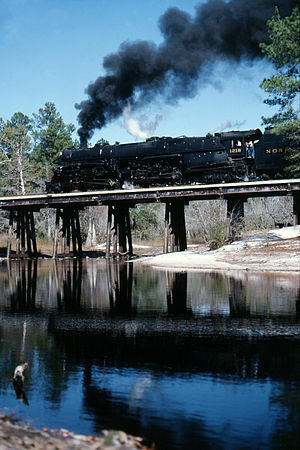 It was retired from regular revenue service in 1959, but Norfolk & Western successor Norfolk Southern Railway operated it in excursion service from 1987 to 1991. Today it is on display at the Virginia Museum of Transportation in Roanoke. NOTE: Make sure that the model CV155=1 project is running "Articulated" sounds with both front and rear cylinders.